KPU's annual Career Day provides employers the opportunity to network and tap into talents in KPU. This event is open to all KPU students and alumni and is organized by KPU's Career Development Centre. Career Day is also a great opportunity to showcase your company and enhance your presence within KPU and stay on top of students’ minds once they leave university. Be a sponsor! Sponsorship provides your organization access to both days of our Career Fair, exclusive advertising on our event program guide and feature your company’s bio in our website and job board (Career Connection). Your company’s logo will also be featured in our printed materials (posters, handouts, volunteer t-shirts, etc.) and digital promotions (including social media promotions and digital signage). 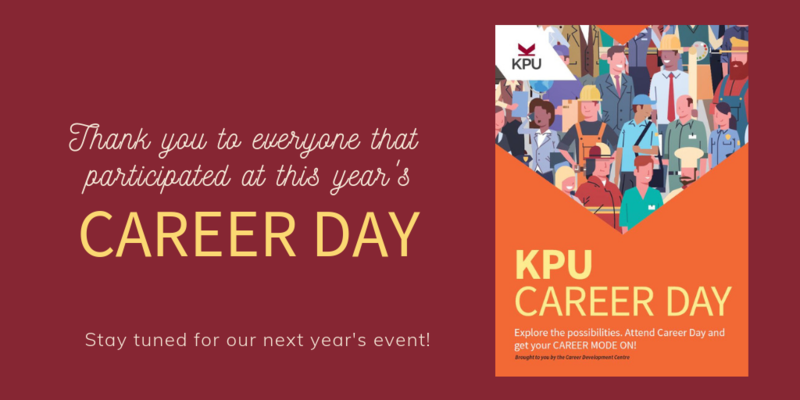 Becoming a sponsor also means supporting KPU students as a portion of the Career Day 2019 sponsorship proceeds will go towards student scholarships. Check out our sponsorship packages and standard event packages now!